Kellie has always been known for her creativity and love of food. But it wasn't until she found herself, with all her children in school full time, looking for something to do with her "grown up" self, that she decided to combine her love of food and creativity into her passion for cake decorating. To perfect her technique, Kellie took the passion to the next level. Determined to learn from the best, she turned to Klara Johnson's School of Confection and Pastry Art. Kellie then took it further at Icing Inspirations School in Kitchener. There, she learned not only from the talented owner Chrissie Boon, but has also learned from some of the best in the business: Courtney Clark, Michelle Bommarito, James Rosselle, Karen Portaleo, Kaysie Lackey and Marina Sousa. Her first wedding cake was for her mom, and she hasn't looked back since! Kellie has appeared on an episode of Cake Walk: Wedding Cake Edition on Slice Network, where she competed against two other designers in a 7 hour design competition. 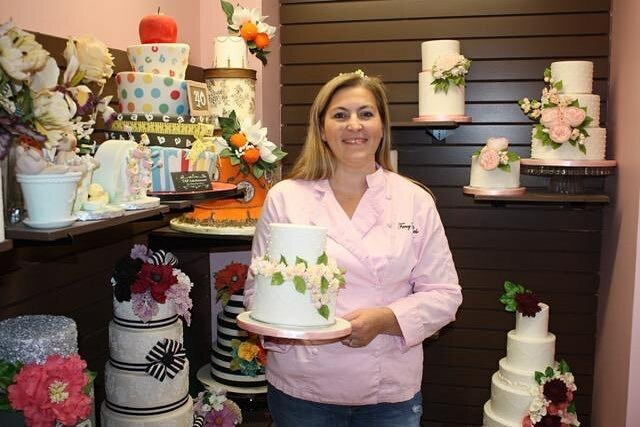 Kellie is dedicated to providing quality, custom designed cakes, and to helping you make any occasion a reason for cake.